At the Default Configuration step of the wizard, you can select to install Veeam Backup & Replication with default installation settings or specify custom installation settings. 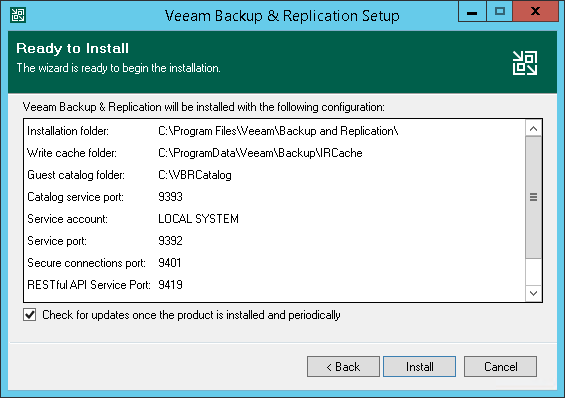 Installation folder: C:\Program Files\Veeam\Backup and Replication. vPower cache folder: the NfsDatastore folder on a volume with the maximum amount of free space, for example, C:\ProgramData\Veeam\Backup\NfsDatastore. The vPower cache folder stores the write cache for machines that are started from backups during recovery verification or restore operations. Make sure that you have at least 10 GB of free disk space to store the write cache. Guest catalog folder: the VBRCatalog folder on a volume with the maximum amount of free space, for example, C:\VBRCatalog. The guest catalog folder stores indexing data for VM guest OS files. Indexing data is required for browsing and searching for VM guest OS files inside backups and performing 1-click restore. Catalog service port: 9393. The catalog service port is used by the Veeam Guest Catalog Service to replicate catalog data from backup servers to Veeam Backup Enterprise Manager. Service account: LOCAL SYSTEM. The service account is the account under which the Veeam Backup Service runs. Service port: 9392. The service port is used by Veeam Backup Enterprise Manager to collect data from backup servers. In addition to it, the Veeam Backup & Replication console uses this service port to connect to the backup server. Secure connections port: 9401. The secure connections port is used by the mount server to communicate with the backup server. For machines running Microsoft Windows 7, Microsoft Windows Server 2008 or Microsoft Windows Server 2008 R2, the setup installs Microsoft SQL Server 2012 SP4 Express Edition. For machines running Microsoft Windows Server 2012 or later, the setup installs Microsoft SQL Server 2016 SP1 Express Edition. Database name: VeeamBackup. Veeam Backup & Replication deploys the Veeam Backup & Replication configuration database on the locally installed instance of Microsoft SQL Server. Leave the Let me specify different settings check box not selected. Click Install. The installation process will begin. To use custom installation settings, select the Let me specify different settings check box. The setup wizard will include additional steps that will let you configure installation settings.